September issues of fashion magazines are traditionally the largest of the year — the volumes with the most pages — not only because of the lavish fall fashion-oriented editorial photoshoots, but because the designers reveal their fall ad campaigns. 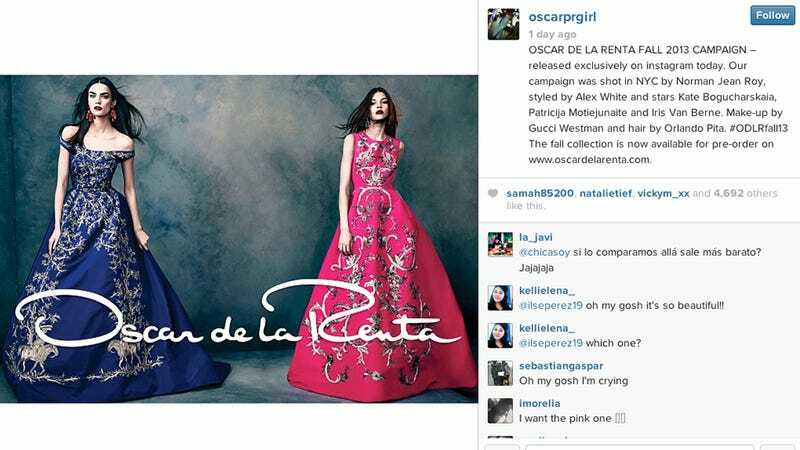 But yesterday, Oscar de la Renta debuted its fall collection on Instagram. A sign of the times. There are many different ways fashion brands are embracing the digital age: Vogue has a Spotify playlist; Marc Jacobs, Urban Outfitters and Gap are using Vine; there are tons of fashion editors on Twitter, from Cathy Horyn of the New York Times to Vogue Italia's Franca Sozzani. By putting ads on Instagram before the September issues hit, Oscar de la Renta gets buzz for offering a sneak peak, as well as instant feedback. Obviously, the brand's goal is that fans will be sharing… and shopping. How that pans out remains to be seen. Of course, a little image on a phone or laptop screen is just not the same as a glossy, full color printed image. And the truth is, though there's been some decline in the magazine biz in recent years, for September 2013, publications are breaking records in terms of ad page numbers. Following fashion brands and editors online may not be exactly the same experience as leisurely flipping through a thick magazine, but there's one user advantage that can't be overlooked: It's free.